Disease features as well as individual patient needs and preferences should drive treatment choices. • The degree to which VEGF or inflammation is the more important driver of the DME process is not the same for every patient. • The hallmark of failure to respond to anti-VEGF therapy is the persistence of macular edema, the degree of which is variable for each patient. • Steroid therapy for DME can be safely used in appropriate patients. As more clinical data on the treatment of diabetic macular edema (DME) emerge, one might expect the application of treatment paradigms to become correspondingly more straightforward. Yet, paradoxically, as we learn more about the DME disease state and the therapeutic indexes of available agents, treatment of the individual patient in clinical practice is becoming increasingly nuanced. Anti-VEGF agents are widely considered first-line therapy for patients with DME, and reasonably so. There is a growing body of evidence suggesting their efficacy and safety for this indication.1,2 However, response to anti-VEGF therapy is not binary. It is not as simple as patients either responding or not responding; they can exhibit a range of responses to therapy. Accordingly, the management of a patient who is minimally responsive to therapy is inherently different from the management of a patient who exhibits either no response or an inadequate response to therapy. Furthermore, a cookie-cutter approach to DME treatment is unlikely to achieve optimal responses universally. Instead, a case-by-case approach that considers factors relating to each individual patient’s clinical features, needs, and preferences drives the choice of which agent or agents to use and how often to use them. The expression swimming in their lane is popularly used to describe how patients respond to anti-VEGF therapy. It refers to the phenomenon whereby patients tend to exhibit the same degree of response over the course of therapy: Patients with a brisk initial response to therapy (ie, a significant reduction of macular edema) will likely continue to have that same degree of response, and patients with lesser degrees of resolution of edema tend to have a similar response over time. However, while the response to anti-VEGF therapy over time is somewhat predictable and known generally within the first three doses, there is no consensus on what constitutes a true response. Although persistence of macular edema is the hallmark of treatment failure, the degree of persistence is variable for each patient. Those who are moderately to dramatically unresponsive to therapy are generally more easily identified, and their unresponsiveness is often apparent in fewer than three injections. Yet some patients may return to 20/20 visual acuity but still have edema, while others may respond anatomically but not experience a return of functional vision. Because the anatomy does not always align with visual function, it is difficult to fully judge response to therapy. A popular notion circulating in discussions of DME treatment is that the early course of the disease is more likely mediated by VEGF, whereas the later, perhaps more advanced, phase is an inflammatory process. Although this is an appealing construct, it is not apparent in my experience that the DME disease process can be strictly attributed to a VEGF or an inflammatory etiology. Rather, DME is both VEGF-mediated and an inflammatory condition. The pathophysiology of DME involves a component of VEGF activation, but anti-VEGF therapy delivers its primary therapeutic benefit in patients with DME largely via its antiexudative properties. By the same token, inflammation certainly plays a role, but it is hard to say much more than that because antiinflammatory agents used in treating DME have anti-VEGF effects as well; thus, a positive response to steroid therapy in and of itself is not necessarily indicative of a purely inflammatory disease state. In truth, DME involves a combined mechanism of VEGF activation and inflammation, and the variable response to available therapeutic agents we see every day in clinical practice suggests that the relative contribution of these two factors varies from patient to patient. 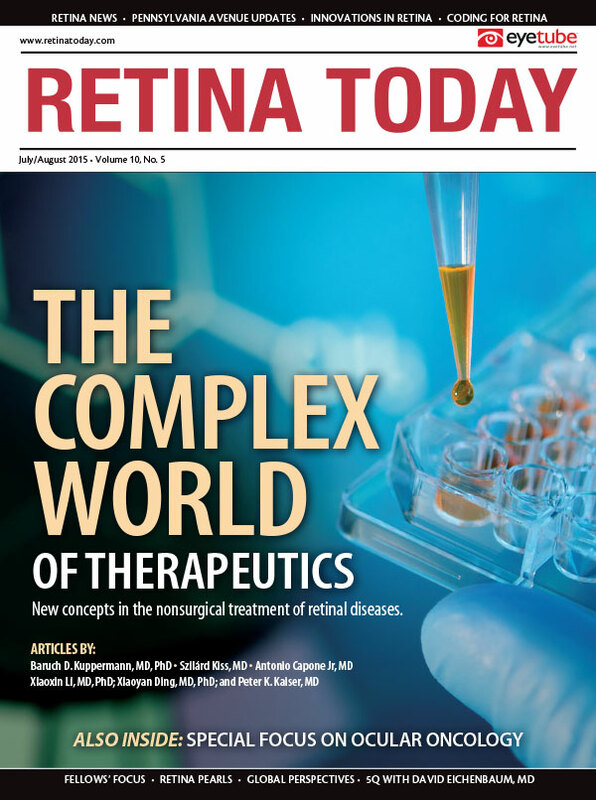 In most physicians’ treatment paradigms, an anti-VEGF agent is the go-to therapy for treatment-naïve patients, and there is a wealth of data from clinical trials to support this approach.3 If response to therapy is highly individualized and the disease process variable, however, then one’s approach to treatment should be flexible. For the phakic patient who is treatment-naïve, anti-VEGF therapy is the most appropriate first step in therapy. The therapeutic index with anti-VEGF drugs in terms of positive therapeutic effect and minimal adverse effects is most starkly positive with this kind of patient profile. However, in pseudophakic or aphakic patients, whether to start with an anti-VEGF agent or a corticosteroid is not as obvious, especially when the patient’s ability to comply with the level of treatment needed to achieve success is considered. Something that must be kept at the forefront in any discussion about DME therapy is that we are dealing with patients who are usually in their prime working years, are already heavily burdened by medical needs, and are therefore unlikely to be able to attend an injection clinic 12 times a year without significant added burden. In the Protocol T study, patients required about nine anti-VEGF doses over 12 months.4 However, because patients with diabetes may already attend more than 20 medical visits per year for their systemic disease, even a reasonable treat-and-extend (TAE) protocol may not sufficiently accommodate the needs of busy patients. From a cost perspective, a less frequent schedule would also be beneficial. For these reasons, if presented with a pseudophakic, working-age patient with no personal or family history of glaucoma, I would feel comfortable considering a corticosteroid early in the course of treatment—even as first-line therapy—not only in the interest of addressing the macular edema, but also to help the patient fit the treatment into his or her life. Patients with a sufficient response to anti-VEGF therapy should probably continue to receive the same therapy that has provided a benefit. If there is a modest or unsatisfactory response, it may be worth considering a switch—sometimes as early as the second or third injection, depending on the patient’s response. I may consider switching within the class for such a patient before moving to a corticosteroid. Generally, I adhere to what are being called the Protocol T criteria, wherein, if a patient has visual acuity of 20/40 or better, then I start him or her on bevacizumab (Avastin, Genentech); if that has insufficient effect, I generally switch to aflibercept (Eylea, Regeneron) because a meaningful difference between ranibizumab (Lucentis, Genentech) and bevacizumab was not demonstrated in the Protocol T results in this population.4 If the visual acuity is 20/50 or worse, I start with aflibercept. If there is only a marginal response, I move on to the sustained-release dexamethasone intravitreal implant (Ozurdex, Allergan). If, over the course of treatment, the patient starts to develop tachyphylaxis, then I question whether something has changed in his or her systemic status; I particularly query patients about their hypertensive and renal status. If the patient’s blood pressure is controlled, the kidneys are healthy, and he or she is not responding to anti-VEGF therapy, then I would follow a paradigm similar to the one described above. Another situation to consider is the patient whose treatment interval cannot be extended on a TAE regimen. In this scenario, I am more likely to move to the sustained-release dexamethasone implant in the interest of introducing a treatment regimen that is minimally disruptive to the patient’s lifestyle. Some attendant concerns exist with use of a steroid implant (ie, cataract progression and intraocular pressure elevation), but these are by and large offset by the therapeutic benefit and may be preferable compared to the alternative. When I have phakic patients for whom anti-VEGF therapy is minimally effective, I move to corticosteroids rather quickly after a discussion of the risk/benefit profile, as the alternative course of action would be vitrectomy with peeling of the internal limiting membrane. I have been satisfied with my clinical practice’s level of effectiveness using the dexamethasone implant. I have also come to understand the nuanced nature of the associated safety concerns in the context of regular clinical practice. In my experience, pressure rises are generally modest and predictable in terms of timing, so I know when to monitor for them. Additionally, pressure rises typically wane as the device erodes. I have found it rare for a patient to have a burst of pressure elevation, rare for a patient to have pressure elevated to 40 mm Hg or 50 mm Hg, rare to have a patient who cannot be controlled on topical ocular hypotensive therapy, and rare for a patient’s pressure not to return to normal as the drug wears off. A bit more thought may be required before using a corticosteroid to treat a patient with diagnosed glaucoma. Although I am reasonably comfortable considering a corticosteroid for a patient whose glaucoma is well-controlled on a single agent and who does not have significant glaucomatous optic neuropathy, I am much more likely to go through all the anti-VEGF agents and keep the patient on monthly therapy before switching class. For patients whose glaucoma is not well-controlled or requires more than one agent to control, or in whom there is some degree of optic neuropathy, I am more likely to consider vitrectomy and membrane peeling, possibly with endocyclophotocoagulation, if I am concerned he or she would eventually require steroid therapy. Antonio Capone Jr, MD, is a partner at Associated Retinal Consultants, Royal Oak, Michigan, and a professor at William Beaumont Hospital-Oakland University School of Medicine, Auburn Hills, Michigan. Dr. Capone may be reached at +1-248-288-2280; fax +1-248-288-5644; or at acaponejr@yahoo.com. 1. Agarwal A, Sarwar S, Sepah YJ, Nguyen QD. What have we learnt about the management of diabetic macular edema in the antivascular endothelial growth factor and corticosteroid era? Curr Opin Ophthalmol. 2015;26(3):177-183. 2. Mitchell P, Wong T; Diabetic Macular Edema Treatment Guideline Working Group. Management paradigms for diabetic macular edema. Am J Ophthalmol. 2014;157(3):505-513.e1-8. 3. Korobelnik JF, Do DV, Schmidt-Erfurth U, et al. Intravitreal aflibercept for diabetic macular edema. Ophthalmology. 2014;121(11):2247-2254. 4. Wells JA, Glassman AR, Ayala AR, et al. Aflibercept, bevacizumab, or ranibizumab for diabetic macular edema. N Engl J Med. 2015;372(13):1193-1203. 5. Boyer DS, Yoon YH, Belfort R Jr, et al; Ozurdex MEAD Study Group. Three-year, randomized, sham-controlled trial of dexamethasone intravitreal implant in patients with diabetic macular edema. Ophthalmology. 2014;121(10):1904-1914.